Pacific Northwest National Laboratory developed this highly efficient, small-scale solid oxide fuel cell system that features PNNL-developed microchannel technology and two unusual processes, called external steam reforming and fuel recycling. Pacific Northwest National Laboratory's new, small-scale solid oxide fuel cell system can achieve up to 57 percent efficiency partly because it uses a heat exchanger with PNNL-developed microchannel technology. 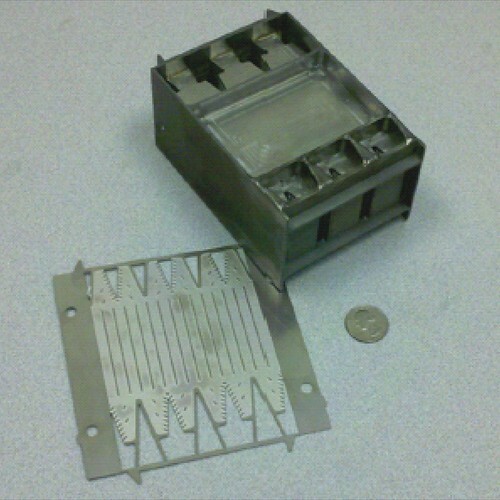 Microchannels narrower than a paper clip are etched onto the heat exchanger's shim, which has been removed in this photo for illustrative purposes. RICHLAND, Wash. — Individual homes and entire neighborhoods could be powered with a new, small-scale solid oxide fuel cell system that achieves up to 57 percent efficiency, significantly higher than the 30 to 50 percent efficiencies previously reported for other solid oxide fuel cell systems of its size, according to a study published in this month's issue of Journal of Power Sources. The smaller system, developed at the Department of Energy's Pacific Northwest National Laboratory, uses methane, the primary component of natural gas, as its fuel. The entire system was streamlined to make it more efficient and scalable by using PNNL-developed microchannel technology in combination with processes called external steam reforming and fuel recycling. PNNL's system includes fuel cell stacks developed earlier with the support of DOE's Solid State Energy Conversion Alliance. "Solid oxide fuels cells are a promising technology for providing clean, efficient energy. But, until now, most people have focused on larger systems that produce 1 megawatt of power or more and can replace traditional power plants," said Vincent Sprenkle, a co-author on the paper and chief engineer of PNNL's solid oxide fuel cell development program. "However, this research shows that smaller solid oxide fuel cells that generate between 1 and 100 kilowatts of power are a viable option for highly efficient, localized power generation." Sprenkle and his co-authors had community-sized power generation in mind when they started working on their solid oxide fuel cell, also known as a SOFC. The pilot system they built generates about 2 kW of electricity, or how much power a typical American home consumes. The PNNL team designed its system so it can be scaled up to produce between 100 and 250 kW, which could provide power for about 50 to 100 American homes. Knowing the advantages of smaller SOFC systems (see the "What is an SOFC?" sidebar below for more information), the PNNL team wanted to design a small system that could be both more than 50 percent efficient and easily scaled up for distributed generation. To do this, the team first used a process called external steam reforming. In general, steam reforming mixes steam with the fuel, leading the two to react and create intermediate products. The intermediates, carbon monoxide and hydrogen, then react with oxygen at the fuel cell's anode. Just as described in the below sidebar, this reaction generates electricity, as well as the byproducts steam and carbon dioxide. Steam reforming has been used with fuel cells before, but the approach requires heat that, when directly exposed to the fuel cell, causes uneven temperatures on the ceramic layers that can potentially weaken and break the fuel cell. So the PNNL team opted for external steam reforming, which completes the initial reactions between steam and the fuel outside of the fuel cell. The external steam reforming process requires a device called a heat exchanger, where a wall made of a conductive material like metal separates two gases. On one side of the wall is the hot exhaust that is expelled as a byproduct of the reaction inside the fuel cell. On the other side is a cooler gas that is heading toward the fuel cell. Heat moves from the hot gas, through the wall and into the cool incoming gas, warming it to the temperatures needed for the reaction to take place inside the fuel cell. The key to the efficiency of this small SOFC system is the use of a PNNL-developed microchannel technology in the system's multiple heat exchangers. Instead of having just one wall that separates the two gases, PNNL's microchannel heat exchangers have multiple walls created by a series of tiny looping channels that are narrower than a paper clip. This increases the surface area, allowing more heat to be transferred and making the system more efficient. PNNL's microchannel heat exchanger was designed so that very little additional pressure is needed to move the gas through the turns and curves of the looping channels. The second unique aspect of the system is that it recycles. Specifically, the system uses the exhaust, made up of steam and heat byproducts, coming from the anode to maintain the steam reforming process. This recycling means the system doesn't need an electric device that heats water to create steam. Reusing the steam, which is mixed with fuel, also means the system is able to use up some of the leftover fuel it wasn't able to consume when the fuel first moved through the fuel cell. The combination of external steam reforming and steam recycling with the PNNL-developed microchannel heat exchangers made the team's small SOFC system extremely efficient. Together, these characteristics help the system use as little energy as possible and allows more net electricity to be produced in the end. Lab tests showed the system's net efficiency ranged from 48.2 percent at 2.2 kW to a high of 56.6 percent at 1.7 kW. The team calculates they could raise the system's efficiency to 60 percent with a few more adjustments. The PNNL team would like to see their research translated into an SOFC power system that's used by individual homeowners or utilities. "There still are significant efforts required to reduce the overall cost to a point where it is economical for distributed generation applications," Sprenkle explained. "However, this demonstration does provide an excellent blueprint on how to build a system that could increase electricity generation while reducing carbon emissions." The research was supported by DOE's Office of Fossil Energy. Fuel cells are a lot like batteries in that they use anodes, cathodes and electrolytes to produce electricity. But unlike most batteries, which stop working when they use up their reactive materials, fuel cells can continuously make electricity if they have a constant fuel supply. 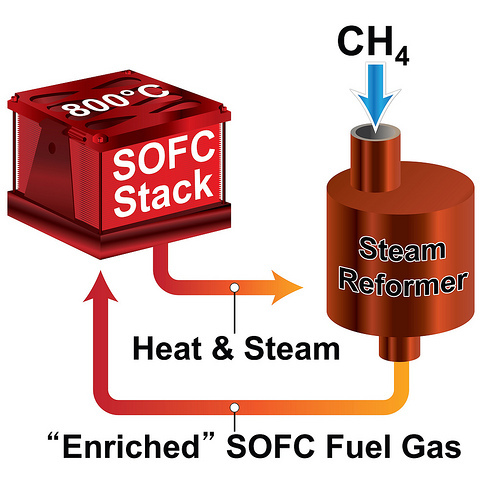 SOFCs are one type of fuel cell that operate at higher temperatures - between about 1100 and 1800 degrees Fahrenheit - and can run on a wide variety of fuels, including natural gas, biogas, hydrogen and liquid fuels such as diesel and gasoline that have been reformed and cleaned. Each SOFC is made of ceramic materials, which form three layers: the anode, the cathode and the electrolyte. Air is pumped up against an outer layer, the cathode. Oxygen from the air becomes a negatively charged ion, O2- , where the cathode and the inner electrolyte layer meet. The ion moves through the electrolyte to reach the final layer, the anode. There, the oxygen ion reacts with a fuel. This reaction creates electricity, as well as the byproducts steam and carbon dioxide. That electricity can be used to power homes, neighborhoods, cities and more. The big advantage to fuel cells is that they're more efficient than traditional power generation. For example, the combustion engines of portable generators only convert about 18 percent of the chemical energy in fuel into electricity. In contrast, some SOFCs can achieve up to 60 percent efficiency. Being more efficient means that SOFCs consume less fuel and create less pollution for the amount of electricity produced than traditional power generation, including coal power plants. Sprenkle and his PNNL colleagues are interested in smaller systems because of the advantages they have over larger ones. Large systems generate more power than can be consumed in their immediate area, so a lot of their electricity has to be sent to other places through transmission lines. Unfortunately, some power is lost in the process. On the other hand, smaller systems are physically smaller in size, so they can be placed closer to power users. This means the electricity they produce doesn't have to be sent as far. This makes smaller systems ideal for what's called distributed generation, or generating electricity in relatively small amounts for local use such as in individual homes or neighborhoods.